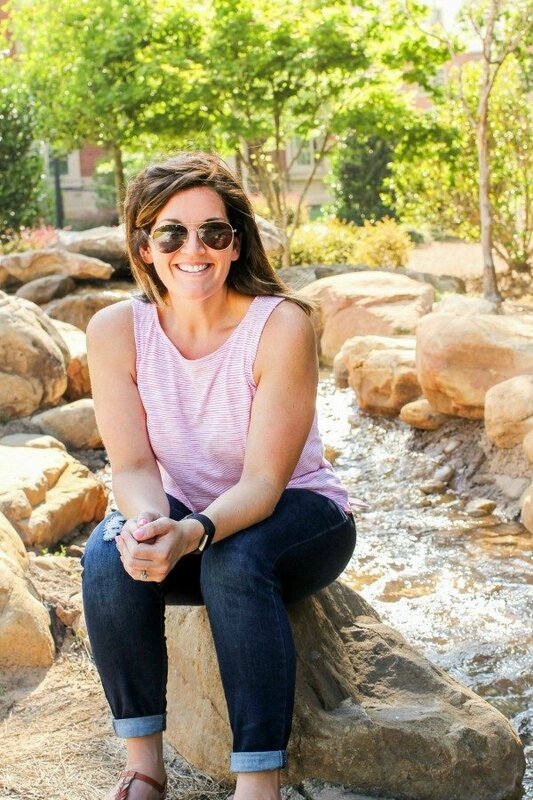 May 16, 2018 By Allyson 31 Comments This post may contain affiliate links. Read my disclosure policy. Having easy weeknight meals is essential at my house because we are incredibly busy. Using the Instant Pot for dinner is a life saver. This Instant Pot Cilantro Lime Chicken takes only 15 minutes in the Instant Pot, and is ready to serve! 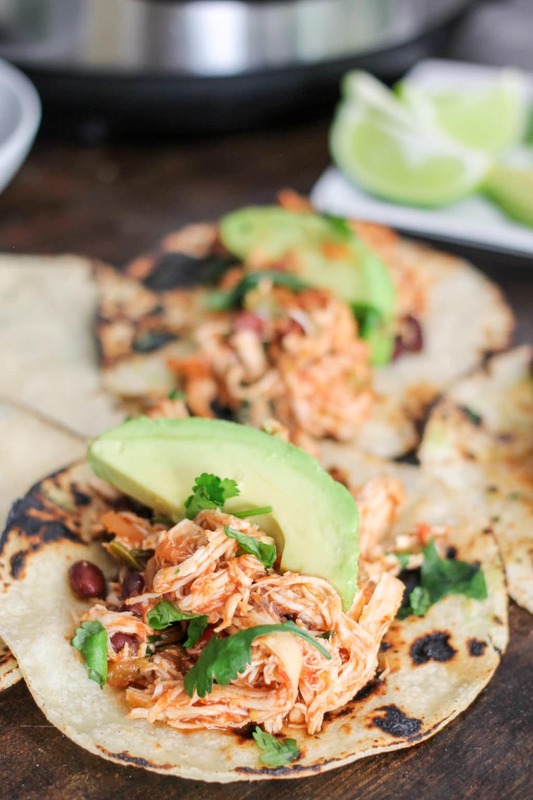 Use the shredded chicken in tacos, burritos, wraps, rice bowls, salads, or even all by itself! Your family will love it, and you will love the minimal cleanup and effort. Prep all the ingredients and then dump them all (except the cilantro) into the Instant Pot! Seal your instant pot and then cook on manual for 15 minutes. Once the time is up let the pot ‘naturally release’ the pressure for 10 minutes, then release the rest carefully. You should remember when using the Instant Pot, that the time it takes to cook the recipe (15 mins), is not the total time of the recipe. You need to give the pot some time to ‘come to pressure’. Shred the chicken (or leave it whole if you want), then add it back to the pot, and add the cilantro to the pot, and stir to coat with the yummy sauce. Make tacos! Hard or soft shells (corn or flour) are perfect for this chicken! Add a side of rice and call it a day! Make a large salad for your family! Romaine lettuce, tomatoes, red onion, corn, and Pepper Jack or Colby Jack cheese all tossed together with the cilantro lime chicken would be a perfect healthy low carb meal. Cook up some white or brown rice and then serve the cilantro lime chicken over the top as a rice bowl. TIP: If you plan to do this, try adding 1/4 cup more stock/water when making the chicken; it will be extra saucy for the rice! Meal prep make-ahead cilantro lime chicken burritos! Add the cilantro lime chicken into large flour tortillas, fold into a burrito and then wrap them in foil or plastic wrap. These will stay good in the fridge for 3-5 days. TIP: FREEZE THEM! Make a bunch of the burritos, wrap tightly in plastic wrap and then freeze! When you are ready to cook, remove from plastic wrap and loosely wrap in a paper towel. Cook 1 min on high in the microwave, then flip over and cook for 1 more minute in the microwave. Lunch is served! NACHOS! Sprinkle this chicken over a bed of tortilla chips, then top with cheese; bake for 10 minutes or until cheese is melted. Top with fresh cut tomatoes, cilantro, and sour cream – YUM! 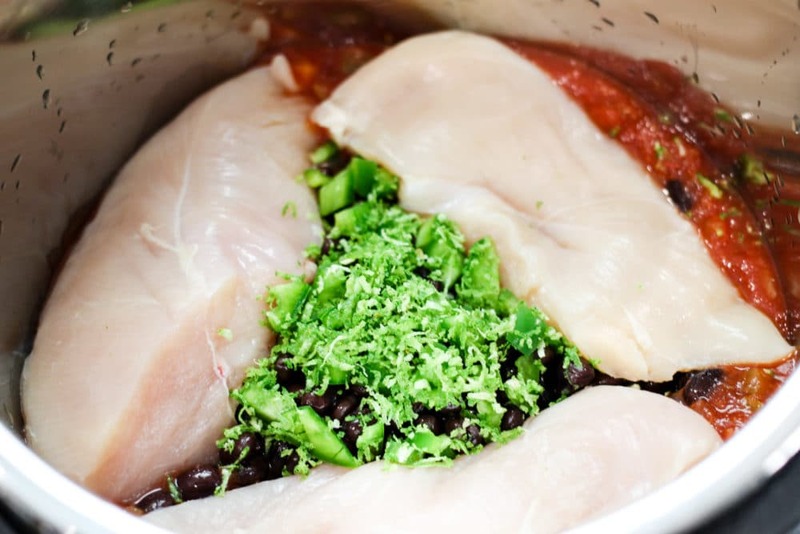 Using at least a 6qt Instant Pot, this cilantro lime chicken recipe definitely can be doubled. Using an 8qt instant pot the recipe could be tripled. Once the chicken is done cooking, and cooled, place portions (I like to do 5 cup portions) into freezer safe zip lock bags. Press flat and squeeze out all of the air. Place flat in freezer, freeze. Remove frozen chicken from freezer the night before you’d like to serve it. Place in the refrigerator overnight, and it should be defrosted by the next day. TIP: Place frozen bag on a dish or in a baking dish. Occasionally freezer bags will leak, and this will avoid a mess all over the fridge. YES! 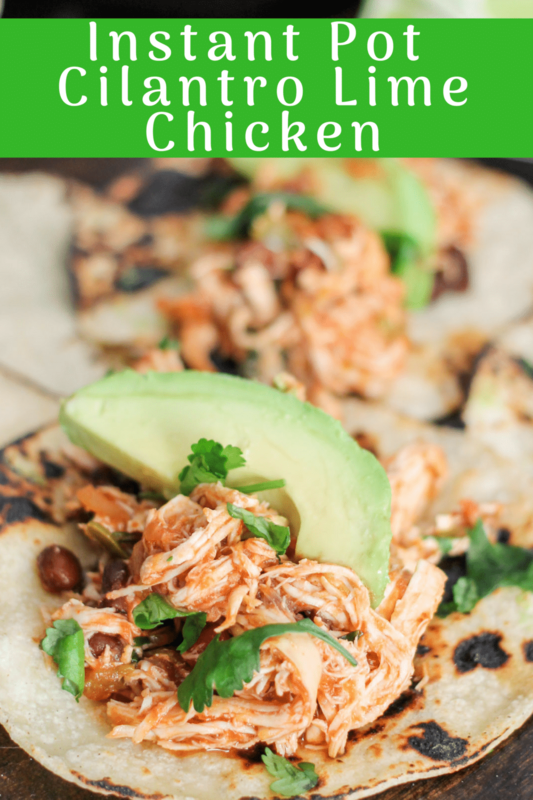 Instant Pot Cilantro Lime Chicken is the perfect healthy meal. Each serving packs 33 grams of protein, only 272 calories, and 4 grams of fat. While this recipe contains black beans making it not so ‘low carb’ you could also opt to leave the black beans out. This would drastically reduce the calories to 208 per serving, but also reduces the carbs to 16 grams vs. 27 grams (23 net) with the black beans. I personally like to have the black beans in the recipe because it adds healthy fiber (4g per serving). You could opt to serve the black beans on the side if you are servings this meal to someone who is eating a ‘low carb’ diet. Using at least a 6qt instant pot, add all ingredients for the chicken into the pot, except the cilantro. Close the lid, seal the pressure valve, then set on manual/high for 15 minutes. Once the time is up, allow the pressure to naturally release for 10 minutes (don't touch it), then manually release the rest of the pressure (by flipping the valve). Remove lid. Shred the chicken breast (either remove and shred or shred in pot using 2 forks); then add the cilantro into the pot. Stir everything together to coat. Serve as desired, top with desired garnishes. 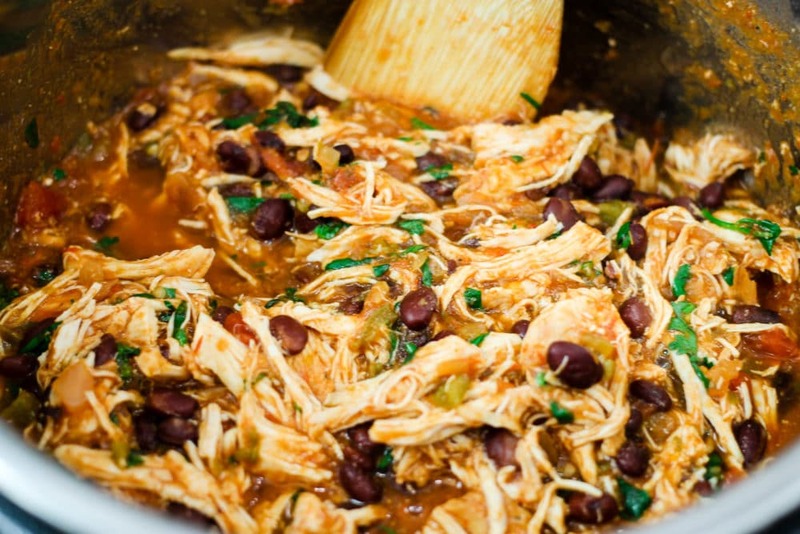 To make in slow cooker: add everything except garnishes to slow cooker. Close lid and cook on low for 7 hours or high for 5 hours. Remove lid, shred chicken, add cilantro and stir to coat. Serve. 272 calories, 4g fat, 27g carbohydrates, 4g fiber, 2g sugar, 33g protein. I am new to the Instant Pot game and I am hooked! I am thinking of all the ways I can use this chicken! mmm..this looks SO delicious! I LOVE that you can make it in the IP!! I love how this chicken can be paired with so many main meals. Love the flavors of this chicken! I love that it is made in an instant pot! 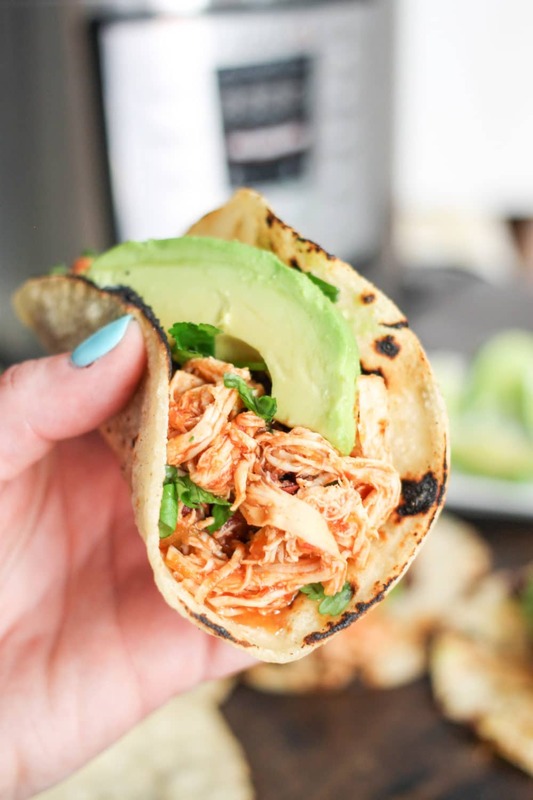 I love making shredded chicken in the Instant Pot, so I can’t wait to try this recipe next! Love this dish! Such an easy dinner! It really is soooo easy! WOW this recipe looks and sounds so delicious! How much time do you need to add if the chicken you put in is frozen? Hi Jamie- I would do 17 mins and then follow the rest of the directions with the natural release for 10 mins etc. Good luck! Did anyone else run into issues with this? I can’t get the IP to pressurize – it’s acting like there isn’t enough fluids. I even added more broth thinking that maybe my salsa was too thick! Any suggestions appreciated! Oh no, Leanne! That is so frustrating! You could definitely add more broth or even water, but it should come to pressure with the suggested amounts. Are you putting the chicken in first? if so, put the liquid in first, then the chicken on the top. I put the liquid in first then added the chicken on top and keep getting a burn warning. This is the 2nd time making it. The first time I got the burn warning and shut it off and stirred it and it was just fine. This time it refuses to come to pressure and keeps giving me a burn warning. Getting frustrated. I too don’t want to add too much broth or water and it has plenty of liquid. What size pot are y’all using? You might need more liquid if you are using an 8qt. I have literally made this at least 10 times and I have never gotten the burn message! I didn’t get a burn warning (didn’t even know there was such a thing). I used my 6qt and added enough liquid that it was way to wet when done and had to be strained.It just wouldn’t come to pressure. It was still cooked thoroughly. That is so weird!!! I am sorry, I don’t have any advice because I’ve never run into this problem – maybe everything wasn’t sealed quite right?? I don’t know!!! Same issue here! Is liquid the issue? So what is considered a serving? 1 cup? Probably about 3/4 cup. However much the recipe yields, divide it into 6 portions and that will be your serving size if you are looking for accurate nutritional information. You can always plug yours with your specific ingredients into a calculator like myfitnesspal. This recipe looks amazing. If I was to double it in my 6 qt IP should I double all the ingredients or just the chicken? I usually just cook 3-4 lbs of chicken with 1 jar of salsa but maybe I should be using more. What do you think? I made this and it was delicious! I used a jar of salsa verde and my own taco seasoning. I would leave out the added liquid next time. I am so glad it worked for you! We love this recipe too! I made it once and it was perfect. The second time I got a “burn” message partway through. I did the exact same thing as the first time, so not sure what happened, but any ideas how to prevent? Also, I wasn’t in the kitchen so I have no idea how far into the cooking process the burn thing came on, so I have no idea how much longer to keep it cooking, so that’s another problem. In general, though, great flavors and came out great the first time I made it! Made this recipe for a family party. Everyone loved it and requested I make it for the next party. I set it up as a buffet for tacos or over rice. Everyone tried both and enjoyed them. Great recipe. Thank you for sharing. Made this tonight and my husband and I both really liked it. It turned out a bit soupy though, I think because I used frozen chicken, so possibly too much liquid but it was still very flavorful! Could uncooked beans be substituted for canned? No. Uncooked beans need to be made before using in this recipe. If you prepare the uncooked black beans before using them, yes, but otherwise, no they cannot be used right out of the bag (dry).